and two posts. Whoa....I better be careful or this will become a habit! Yesterday was absolutely miserable here in Plymouth. Just awful weather and so I wasn't able to get my long walk in. I kept hanging about hoping for a 2 hour window in the weather but it never happened sooooo what's a housebound (crafty) gal to do but make good use of her time in the now clean and organized craft space. And that is exactly what I did. I needed to make a birthday card and I find that when I need cards of that sort I tend to go for cards that are more "in season" and then put a birthday greeting in side them more so than reaching for a true, blue birthday image. Actually, I have kinda few birthday stamps as a result. But if a birthday falls in Autumn....beware! You are going to get a card with pumpkins, apples or cornstalks from me! It is always a way for me to use some of my most favorite color combinations more often! And I am going to enter this into a challenge. Over at the Simon Says Stamp Blog this weeks challenge is to use Autumn Leaves. I have never entered any of their challenges but who can pass up a challenge to use colorful leaves right? And this Heartfelt Creations background stamp seemed just the stamp to take center stage! I love this particular leaf stamp and it is actually quite a bit bigger than I have shown. That is a great detail about large background stamps....they can be stamped and trimmed to fit your project and are often stars in their own right! I don't think that I have actually ever used this particular stamp as a background! And, again I used Faber Castell Big Brush markers...they really are so fast and quick for coloring. I still love my copics and pencils but this color job took me about 15 mins with the Big Brushes and sometimes a card just needs to be quick! Also, lately I have begun to try and dress up some of my cards on the inside. So, here is the inside of that card. Today it is sunny and, wait for it.....nearly 40 degrees colder than it was for the last two days. Yikes. But it is the sun that I am happy for and so I will be able to get out for a long walk....TIP ALERT! For those of us who live in areas where it does get cold and nasty put a thin layer of Aquaphor on your face before long walks, runs etc in order to protect it from windburn and the cold! My daughter taught me that. She is almost 23 and she also puts a very thin amount on her teeth before she drinks wine or coffee so her teeth do not discolor over time. 'Course I never remember this tip until I already have two glasses of red in me! Oh well - ;-D Take care and enjoy your weekend! Hi Sheila! So glad to see you playing along with us at the Simon Says Stamp challenge; I hope you'll continue to play often! What a beautiful entry - gorgeously colored, and I love your added gingham ribbon and bow! Hugs! Pretty leaves! Enjoy the fall! 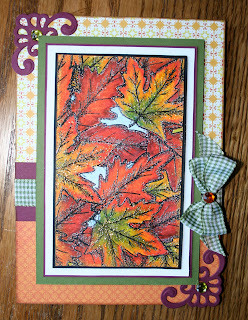 Great fall/leaves card, Sheila! I love the colors you've used. Never fear, once it gets cold enough to get windburn I do not go for walks!! Guess I'm a sissy; but I do not like cold weather. LOL Sounds like a great tip for those who do brave the weather. These leaves rival Mother Nature's!!! Spectacular colors Shelia!